Salivary Glands are Exocrine Glands which are affected by many Drugs, these drugs affect their function, secretion and Size of the Glands in general or affect Specific Gland. In many cases we see that even in the absense of medication some patients suffer from lack of or Excess saliva secretion and this should be considered before going for treatment plan. 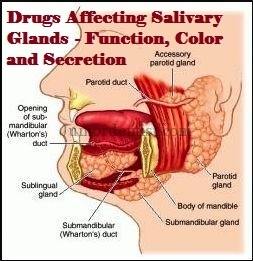 Side effects of Drugs on Salivary Glands is being discussed in this post. Sialorrhea or Hypersalivation is a condition of the salivary glands where increase in the amount of salivation is seen. It can be caused due to many factors but here we are giving you the list of Drugs causing Hyper salivation or Sailorrhoea. All these drugs carry a dose-dependent risk of sialorrhoea and the physician should inform the patients or parent about the same before starting the treatment. Salivary Gland Swellings can be either Localized or Generalized and the need for a proper differential diagnosis is necessary as swelling of salivary glands can be due to any Tumors, Cancers etc of the salivary Gland after eliminating all the above we have to look into drugs causing the swelling.